Until very recently, man has viewed the skies only within the visible spectrum. When LOFAR, the world's largest telescope, looks to the heavens, it sees the depths of the universe in radio. LOFAR stands for Low Frequency Array for Radio Astronomy. The system was built and is operated by the Netherlands astronomical foundation ASTRON. Since the amount of information radio telescopes can collect is limited by the size of the array and financial restricts limit the potential size of the telescope itself, radio telescopes haven't been able to acheive the resolution necessary to study the deep universe. LOFAR completely avoids this issue using a revolutionary design based on a vast array of omni-directional antennas. 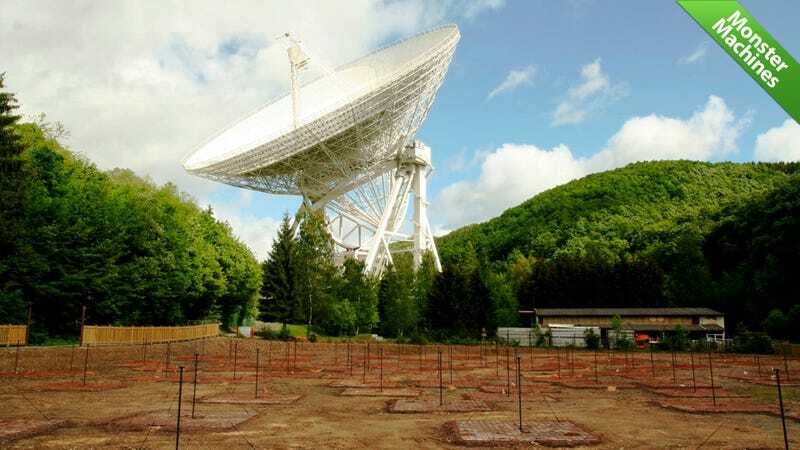 Instead of trying to build a single monumental telescope, the system uses an interferometric array of 15.000 small antennas and 77 larger stations (both seen above —the antennas are what're staked in the foreground). These various stations are clustered across 1000km of Europe. The Netherlands (obviously), Germany, Great Britain, France and Sweden all host antenna stations with more currently under construction in other European countries as well. The system observes at radio-frequencies at ~10–240 MHz, with a total effective collecting area of about 1 square kilometer. Because the collection area is so massive, the system can achieve greater resolution and greater sensitivity than previous radio surveys at that frequency. And because it uses simple, omni-directional antennas, rather than a single dish, LOFAR can observe in several directions simultaneously. Phase delays between the antennas steer where the system is "looking." Once collected, data is then transmitted to the University of Groningen where a Blue Gene/P supercomputer uses aperture synthesis software to assemble the mapping. The arrays will primarily peer into the earliest parts of the Universe—as far back as the Epoch of Reionization (Best. Epoch. Ever. ), the so-called "dark ages" after the Big Bang when the universe recombinated and turned neutral. It will also shed light the formation of massive black holes, galaxies and clusters of galaxies, map of the entire sky visible from The Netherlands in a single night, study solar coronal mass ejections.